The Saronic one-week flotilla sails a northern route around the islands of the Saronic Gulf visiting charming little ports such as Vathi or Perdika, each with its own special character and charm. Our second one week cruise is the popular Argolic route sailing south to the renowned and uniquely pretty islands of Hydra and the harbours of Ermioni, Astros or Plaka. A two-week cruise combines the best of the Argolic and Saronic route. or why not choose the East Peloponnese route, a dedicated two week cruise that explores the southern ports of the Eastern Peloponnese coast , visiting Monemvasia, Greece’s own mini Gibraltar and Leonidhion before venturing north into the Argolic Gulf to go ashore at Navplion to visit ancient Mycenae a city dating back to 1250 BC. Saturday: Poros – Arrival/Departure Two-week flotilla continues Independent sailing before rendezvous in Ermioni. Sunday: Ermioni (23nm) - After dinner, stroll the scenic route around the pine-clad headland. Monday: Astros (17nm) - A traditional beach resort crowned by a ruined fortress - or Vivari. 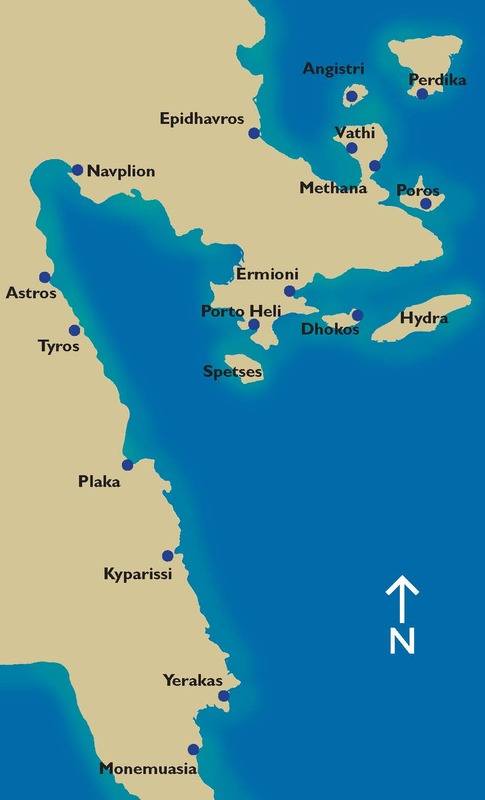 Tuesday: Navplion(22nm) - A chance to visit ancient Mycenae. Wednesday: Plaka / Leonidhion (14nm) - Stroll up the hillside path to visit the ancient clifftop town. Thursday: Dhokos Island or a bay near Porto heli (35nm) – Join us for a Beach Party. Friday: Poros (18nm) - A lively last evening in town. Saturday: Athens – Arrival/Departure - Transfer to Poros to join your yacht. Sunday: Vathi (22nm) - Pretty near landlocked harbour with a great village atmosphere. Monday: Epidhavros (10.5nm) - Visit the ancient amphitheatre or simply relax and enjoy the beach. Tuesday: Korfos(11nm) - A picturesque harbour with choice of tavernas. Wednesday: Aegina (17nm) - Explore this vibrant town, shop from colour fruit & veg boats or swim from the beach. Thursday: Perdika (4.5nm) - A delightful beach and great choice of sea front tavernas.